Ethiopa’s Getaneh Molla won the Dubai Marathon ahead of compatriot Herpassa Negasa on Friday, as both runners broke the course record set by Mosinet Geremew last year. Molla endured a tough challenge from Negasa in the closing stages to cross the finish line in 2:03:34 as the Ethiopans dominated the 20th edition of the race. The duo took full advantage of good conditions for running to eclipse the time of two hours and four minutes set by compatriot Geremew last year. 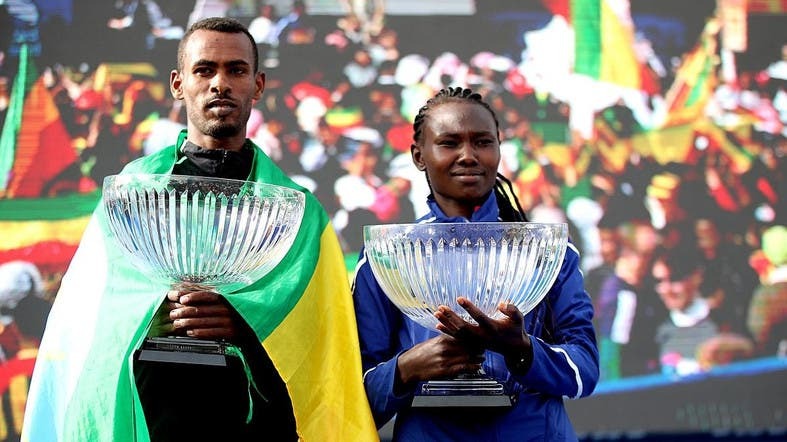 Asefa Mengstu completed an all Ethiopian podium with 2:04:24 for third place. Kenya’s Ruth Chepngetich won the women’s race with a time of 2:17:08 to become the third fastest woman in marathon history after Briton Paula Radcliffe (2:15:25) and compatriot Mary Keitany (2:17:01). Debutant Chepngetich, who set her previous best en route to winning the Istanbul Marathon two months ago, finished ahead of Ethiopians Worknesh Degefa Debele and Workenesh Edesa Gurmesa. The men’s and women’s winners took home $100,000 each with the organisers reducing the prize pot by half this year, after the International Association of Athletics Federations (IAAF) did not grant the event a platinum label.